Planning for an effective implementation calls on schools to carefully review the expectations of key personnel involved in Reading Recovery. Building a shared understanding of the roles and responsibilities of the site coordinator, teacher leader, and Reading Recovery teachers is critical to the success of Reading Recovery in any implementation. Publications Three RRCNA publications, A Site Coordinator’s Guide to the Effective Implementation of Reading Recovery, A Principal’s Guide to Reading Recovery, and Standards and Guidelines of Reading Recovery in the United States, are valuable implementation resources. 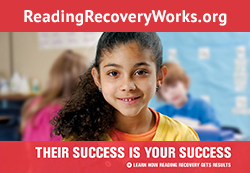 Conferences Districts wishing to implement Reading Recovery effectively are also encouraged to attend the annual National Reading Recovery & K-6 Classroom Literacy and the Reading Recovery Leadership Academy which is held every other year in Washington, DC. Both are venues that allow districts to attend sessions specifically aimed at improving implementation of Reading Recovery. Training centers Additional help with implementation can be obtained by contacting a university training center. Find and contact the training center nearest you. Self-assessment questionnaires are intended for internal school district and training site use and are not submitted to the university training center. School leaders may choose to use only part of the questionnaire at a time or to survey just one stakeholder group. The questionnaires were developed by the Implementation Committee of the North American Trainers Group (NATG) and are intended to supplement reports from the International Data Evaluation Center (IDEC). IDEC reports provide both summative and formative data at the school district, training site, and national level. Questionnaire topics include adherence to standards and guidelines, the fit of Reading Recovery in the comprehensive literacy plan, and communication. Administrators who pilot tested the questionnaire reported the self-assessment led to good discussions about goal setting, monitoring results, and reinforcing joint responsibility for Reading Recovery results. See Mary Jackson’s article, “New Self-Assessment Questionnaires Help Schools Identify Implementation Issues,” (PDF) for more information. Across the nation, many school superintendents and other administrators face enormous challenges as they balance financial realities with their responsibilities to provide high-quality instruction. Adding to the problem is the complex marketplace for reading programs and interventions from publishers, independent organizations, academic institutions, and reform models. It is difficult to wade through this information and independently evaluate options. In these turbulent times, informing decision makers about Reading Recovery is more important than ever!